PARIS (AP) — A French police official says a high school principal and two others have been shot by a 17-year-old student, and authorities believe there is no reason to suspect the attack is related to terror. 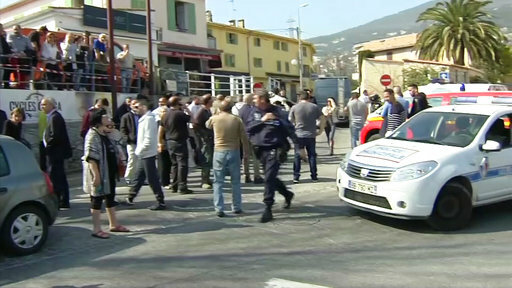 Police surrounded the area around the Alexis de Tocqueville school in the southern French town of Grasse. The official says in addition to the three wounded in Thursday’s shooting, five other people are being treated for shock. None of the injuries is life-threatening. Interior Ministry spokesman Pierre-Henry Brandet said a 17-year-old student from the Alexis de Tocqueville school in the town of Grasse was arrested after Thursday’s shooting at the school. “We are still in the phase of rescue, of searching for a possible second perpetrator,” Brandet said on BFM television. The official said there did not appear to be any other suspects, although police are working to “remove all doubt.” The official, from the national police, was not authorized to be publicly named. An employee of a nearby electronics store said police had asked residents to stay indoors. An employee of sports chain Decathlon, which has a branch less than 500 meters from the high school, said he’d seen about 40 high school students leaving from the area and gathering in a nearby parking lot. The shooting at the high school comes as France remains in a state of emergency following deadly attacks in Paris in 2015 and an attack last year in Nice.